Bringing sustainable ideas and practices into your home begins one room at a time! Here are some ways you can turn your bathroom into a healthy, eco-smart space. The function of your bathroom demands privacy, but this doesn’t mean it should be a closed box with no windows. Windows can be placed with care, facing a private or secluded area of your yard. This will bring in healthy, beautiful, natural daylight along with relaxing views of nature. Use recycled products and materials for flooring, cabinets, countertops, etc. Whole fixtures (like a bathtub!) can be reclaimed, re-finished, and fitted with water conserving faucets. Reclaimed materials, large and small, can add character to your bathroom. Take a look at recycled and reclaimed options and decide what best fits into your bathroom. If you choose to purchase new products for your bathroom, make sure the materials are eco friendly and are free of toxic components. Also focus on mold resistant and water resistant materials, like tile or stone. These may need to be sealed periodically to ensure their water resistance, and there are low VOC sealers available for such a task. Think about the accessories and products you use in your bathroom, such as towels and shampoos. Choosing all natural or chemical free options adds yet another layer of green to your bathroom and lifestyle. Choose low flow faucets, shower heads, and toilets to save water! Insulate your tank water heater or pipes carrying hot water to increase efficiency and decrease the chance of condensation on pipes creating moisture within walls. 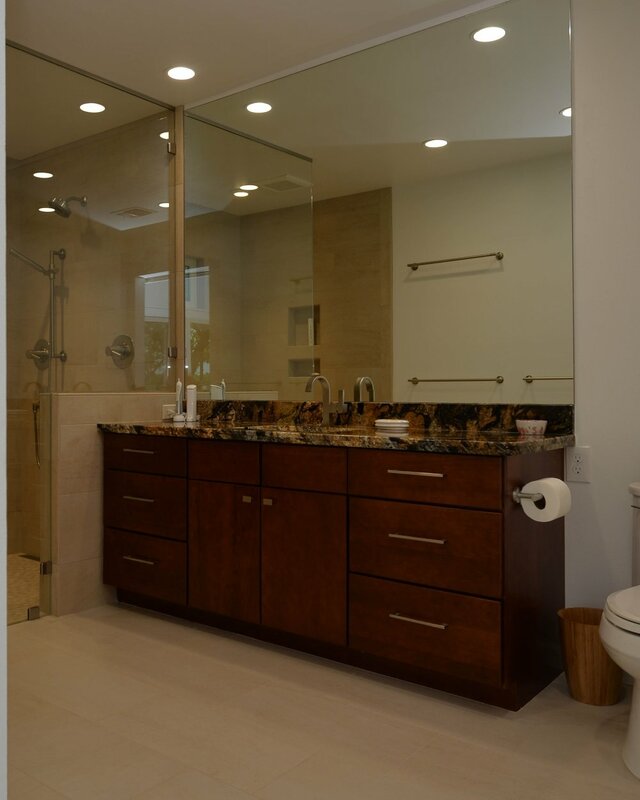 One of our previous blogs mentioned the importance of ventilation in a bathroom. Each bathroom should have a vent to extract humidity and moisture, preventing mold growth. Having an operable window can also help to ventilate and will bring in fresh air as well. Maintaining your bathroom and keeping fixtures in good working condition is a way to ensure your bath’s longevity. It also decreases the likelihood of major repairs down the road. Locating and fixing leaks is also essential, not only to conserve water but also to prevent water from damaging your bathroom and home. Sustainability is about future thinking and the responsible use of resources – make sure these two thoughts are a part of your bathroom design and help guide your choices! Home remodel in Bryan / College Station, by Stearns Design Build. We always think green at Stearns when it comes to every remodel.